...And LOTS AND LOTS to drink! One of the best decisions Scott and I made with Rasmus was to put a watermaker on board. We loved it and loved knowing that we didn't have to schlep jerry cans back and forth from boat to shore to fill up. We also loved knowing that we could take showers daily, use fresh water to clean and rinse our boat, and, in general, use good ole H2O a little more liberally from time to time. Notice I said a "little" more liberally. When we bought our new boat, we decided that we wanted to install a high-output watermaker to allow ourselves even more liberal use of water to accomodate our growing crew (Isla likes her bathtime!). The ability to take longer showers, thoroughly rinse our boat and gear after passages, and drink as much water as we please all make cruising more like living and less like camping. Once we decided that a high-output unit was what we wanted, I did what I do best; and hit the interweb to do some research. I've mentioned before that a perk of having a fairly popular blog is the fact that we get lots of emails and input from followers, and more than a couple of you suggested we check out Cruise RO Water and Power. I did some more investigation and I liked what I found. Designed for cruisers by cruisers, Cruise RO Water and Power creates affordable, efficient, high-output watermakers to quench the saltiest of sailors! There are so many "perks" with this company that it's hard to single one out - but to me, the biggest perk is their customer service. They pride themselves in getting back to inquiries within hours and in today's world of telephone automation and "push one for...", having some decent customer service is a major plus. The other perk is the fact that the units are incredibly competitively priced. Their watermakers use no proprietary parts which not only helps keep the cost of the units down, but means you can buy parts for your watermaker at most hardware stores. 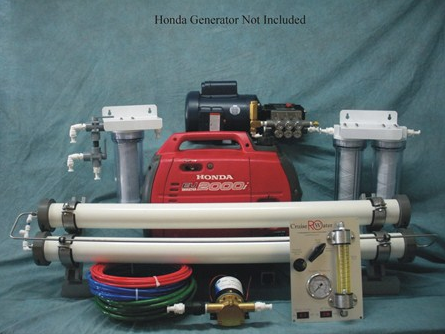 What also makes these watermakers unique is the fact that they are designed to run off a Honda generator, rather than your ship's batteries. Because we have a genset on our new boat, we will be hooking our new SeaMaker 30 up to that. We anticipate only having to run our generator one hour every five days. Sure, you can run your watermaker off your batteries, but at such a high amperage draw most people have to run their engines to make water anyway, and we've decided powering our unit off the genset is the way to go. Finally, Cruise RO (that's Reverse Osmosis if you were wondering) Water and Power backs their product by offering an industry best three year warranty and a lifetime guarantee of stainless steel parts. That's pretty good if you ask me. We'll keep you posted on the entire process with our new watermaker; from the dry fit to the installation, from the test run to a recap and review 2-4 months down the line. We're looking forward to it! Awesome- can't wait to hear about the rest of the process because we just bought a Katadyn water maker to put on our boat. We haven't installed it just yet (next haul out) but I'm am super excited about having on onboard when we start cruising again this spring... I am definitely not a fan of lugging around all those jerry cans! We have a Spectra and we love it, but at 6 gallons an hour, I'm a little jealous of your high output! I've heard great things about the Cruise RO. I think you made a great choice. Watermaker? What the heck is that? We just use a bucket here in Lake Michigan (but NOT in Muskegon Lake!). I'm so glad you went with their watermaker. Rich and Lori are terrific people. You couldn't do better for customer service. Even though we don't have one yet, I've been running an ad for them on my blog for awhile because I believe it's the best system. Perth water treatment is amazing so I am not worried with our water supply. Cruise RO is really generous because three year warranty is a great deal. I’m trying to educate myself on this cause I just moved to Nevada and have hard water in my apartment. But I can’t use a whole house softener since I rent. And I am getting really tired of the dry skin and hair. It’s getting really frustrating trying to find solutions for renters since everything seems aimed at home owners. But, if I ever end up in a house with this problem, I guess I’ll know what to do.